AIDS: re-reading the whole book, not the last chapters..!! If you try to search in the library or over the internet for AIDS, you will find a huge amount of information available. You will also figure out that all scientists reach a dead end at the step of treating or vaccinating against AIDS. Their stop makes you never stop thinking: why can’t they continue? Why is there no cure for such a disease? Or at least why can’t they stop the progress of this illness by simply making a vaccine? It is like reading the same book millions of times without understanding its end, then you re-read the last chapters but still “YOU CAN’T”!! I think that we need to restart reading the book from its beginning. We need to re-read about the origin of AIDS infections, to know more about HIV genome, and how its genes function; then we may know how to slow down or terminate progression of the virus inside the human body or at least to stop its passage from an individual to another. Hence, we may be able to read the book again and this time we can understand its end. AIDS was initially reported on June 5th, 1981. But, it is more precise to mention the first documented AIDS case, which was in 1959. At that time, no one was able to define such an illness; however, scientists did a favor for the humankind by preserving the infected tissues till someone would be able to define HIV, i.e. after 1981. I may ask why not before 1959? But who can answer a question like this? The origin of AIDS has so many controversial theories, including conspiracy theories. One of these is that HIV arose as a result of leakage in the US governmental or military labs during the development of a biological weapon. You may ask Dr. Leonard G. Horowitz (the author of Emerging Viruses: AIDS & Ebola. Nature, Accident or Intentional? And Death in the Air: Globalism, Terrorism and Toxic Warfare) for evidence to prove such an idea. As wikipedia page of ” AIDS origins opposed to scientific consensus” mentions his theory which claims that AIDS virus was engineered by such U.S. Government defense contractors as Litton industries for the purposes of bio-warfare and “population control”. Dr. Alan Cantwell (the author of AIDS and the Doctors of Death) supported this theory, by naming one scientist that led the US military research on homosexual and bisexual men between 1979 and 1981; he attributed these research activities to Dr. Wolf Szmuness. And, when Dr. Alan was asked about the cases that were reported before 1979, his answer was that the American media masked the truth at that time! This has been also mentioned on “AIDS origins opposed to scientific consensus” Wikipedia webpage. Another unreliable hypothesis had been advanced by Edward Hooper, as he accused Hilary Koprowski, the polish virologist and immunologist who was preparing polio vaccine using tissue cultures from non-human primates during 1950s, that he might have transferred AIDS from monkeys to human. This idea couldn’t be evidenced when one of these vaccine vials had been checked in 2000 to show negative HIV or SIV (Simian immune-deficiency virus that infects chimpanzees). Also, by checking the protocols of that old research, it is clear they were working on monkeys’ kidney cells that cannot transmit AIDS. But can one negative vial become a prove for the whole negativity?! The most accepted and recent theory assumes that HIV is an evolution from SIV. 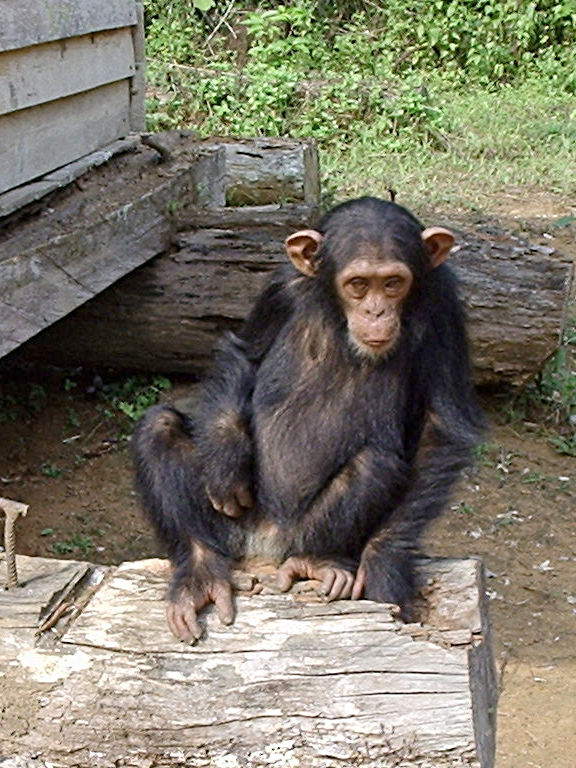 This Cameroon Chimpanzees theory was suggested in 2006 after a study on genetic samples from more than 1300 chimpanzees within 7 years by Dr. Beatrice Hahn. It seems that one person had been bitten by one of these apes or got cut while he or she was trying to slaughter one of these animals, maybe for eating purposes!! If this Chimpanzee in the picture is the main suspect now for HIV triggering on earth, the question now is: Do we have current reports for the same transmission from apes to human? If yes or no, I think we need to re-study and search that SIV which might tell us something about its “daughter” HIV (as accepted by most of the scientists). It is like reading the book from its beginning not the last chapters, sure it will tell us new things.. Like what? I really dont know, it may be like the first idea that led to inventing the nuclear bomb, would you believe me if I told you more than 60 years ago that there is an idea to bombard the nucleus to make a huge bomb? It was just an idea, but the know how was not known. I think it is the same for the AIDS book: we need to re-read but we still don’t know what is going to happen after that reading. All I know that we need to re-read with a new vision, not the same ordinary way of reading. A new study reveals that people infected with bilharzia, or other parasitic worms, are more likely to become infected with HIV than normal persons. This was proven through an experiment where the infectious dose of an HIV-like virus necessary to infect rhesus macaques was found to be 17 times lower in animals with acute schistosomiasis than in controls. The animals co-infected with Schistosoma mansoni also showed higher memory cell concentrations of virus casuing a more rapid progression to AIDS. These findings prove the assumption that persons living in highly endemic areas for parasitic worms have a higher risk of acquiring HIV/AIDS. Previous studies by other research groups have demonstrated that the presence of schistosome infections increases viral replication in animal or human hosts with established immunodeficiency virus infections. Both findings are surely to have profound public health implications for the under-developed areas of the world where both parasitic worms and HIV virus are endemic.